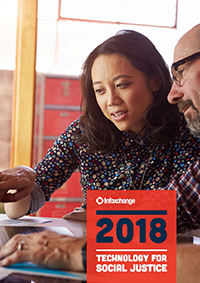 It is with great pleasure that we present Infoxchange’s Annual Report for 2018. We believe technology has a crucial role to play in solving our biggest social challenges. That’s why we’re incredibly proud to showcase our work from this past year, which uses technology to empower vulnerable people and communities while also helping our sector ensure they have the right tools for the job at hand. In the past year alone, we are proud to have supported over 8800 not-for-profit, community and government services and helped more than 1.7 million people in the community. In everything we do, we continue to work towards our vision of technology for social justice.